Rep. Rubio (bicycle not included). There’s more than one way to Santa Fe from Las Cruces, and Rep. Angelica Rubio has found a lively one. 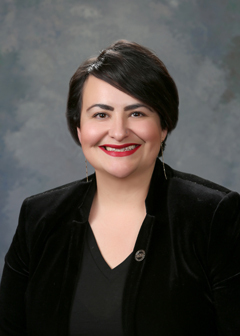 The Las Cruces Democrat will be riding her bike to the City Different for the upcoming legislative session, according to the Albuquerque Journal. Rubio hopes to use the ride in part “to raise awareness about a proposal to create a new state office of outdoor recreation, an idea that’s supported by Gov.-elect Michelle Lujan Grisham,” according to the Journal. No word whether she’ll be on an e-bike, the flavor of the moment. But she will be riding gravel whenever possible, so she’s got that going for her, which is nice. Follow along via www.rubiosride.com. This entry was posted on December 10, 2018 at 7:20 pm and is filed under Bicycle travel, Bike stuff. You can follow any responses to this entry through the RSS 2.0 feed. You can leave a response, or trackback from your own site. That’s pretty neat. You going to join her on the tour? Paddy me boyo, I haven’t been invited. I should ring ’er up, give ’er the old, “Do you KNOW who I AM?” routine. That always wins friends and influences people. I wonder how she proposes to get from ’Burque to Fanta Se? Maybe she knows a secret gravel road. I’ve wondered about routing. Seems NM 14 is the obvious choice but one has to go “around the horn” through Tijeres. NM 313 seems to dead-end you in the Pueblos to the west of I-25. Plus I like the idea of stopping for a beer in Madrid. Stopping for a beer would be good if the temperature is above freezing. I’m up for riding from Duke City to Fanta Se with her. Any other takers? What’s this? A RUBIO I can like? Go for it, PO’G and Co!!! !